P.R.T. 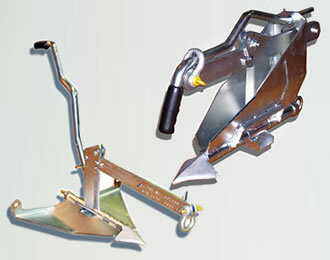 Portable rescue tree land anchor is top gear when you have a winch but no means of an anchor point when having to winch your self from a bog situation, the PRT is an Australian land anchor design patented and invented by Rex Francis whilst developing the incredible Sarca boat anchor, How effective is the PRT? 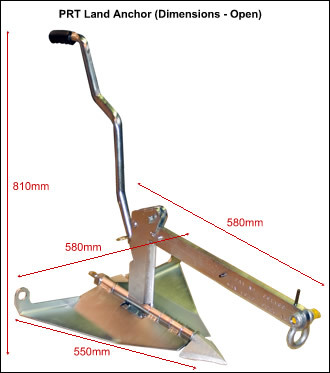 See the very popular TV show Top Gear, Jeremy Clarkson is driving a vehicle to a destination that no vehicle has been before, only made possible with the aid of our PRT Land anchor, now that's what we at Anchor Right Australia call top gear. 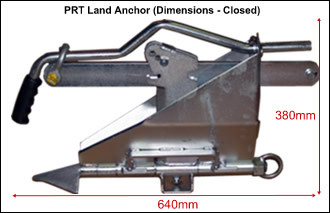 A land anchor that's extremely compact and easy to use with a power winch or tirfor. The Portable Rescue Tree (PRT) was strain tested by NATA and withstood an incredible 12,000lb load! When folded, the P.R.T is approximately the size of a briefcase, and its comfortable handle makes it just as easy to carry. A - Remove pin from the handle. B - Loosen fluke nut. C - Remove Bow Shackle. D - Lift and withdraw handle from unit. A - Open wings into operating position. (Keep Feet Clear). D - Attach winch hook to bow shackle (From step 1C). A - Fit the handle to the position provided (Relocate pin from into handle).